The fires from Monday's derailment of a train carrying crude oil in Fayette County, West Virginia, continued to burn Tuesday morning, and emergency shelters for hundreds of people who had to evacuate after the derailment remain open. "A CSX train, hauling 107 tank car loads of Bakken Shale crude oil from North Dakota to a transportation terminal in Yorktown, Virginia, derailed in Adena Village near Mount Carbon and Deepwater West Virginia about 1:30 p.m. Monday," according to the Charleston Gazette and Staff writer Ken Ward Jr.
"Witnesses saw a gigantic fireball raise to the snow-filled heavens. This is the second terrible trauma in as many years to his the Kanawha River valley. Last January a chemical spill from coal industry connected Freedom Industries storage tanks endangered the water of 300,000 people for weeks. It's time to ask you town or county or state -- what is on the rail cars travelling through our community??" Bakken crude has shown to be a volatile form of crude requiring highly flammable chemicals in its transport from North Dakota and other shale gas and oil fields. According to Lynn Cook in the Wall Street Journal, this risk is well known to oil and transport companies. "Data released by a lobbying group for oil refiners confirmed that crude from the Bakken shale in North Dakota is very volatile and contains high levels of combustible gases..."
Now, who is surprised at this reaction from that group? 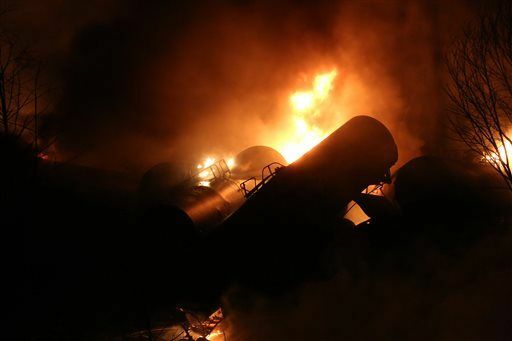 "The crude," which has been linked to no less than four fiery rail accidents in a year, "is no more dangerous to ship than oil from other shale regions and is being correctly loaded and transported under existing federal rules. New rules aren't warranted," the group, the American Fuel and Petrochemical Manufacturers, said Wednesday. Federal Railroad Administration workers were only able to get within 50 yards of the derailed cars late Tuesday morning, according to the agency. Some of the rail cars were still on fire, and local emergency responders were still in charge of the scene. Flames also burned power lines in the area, knocking out electricity to about 900 customers in the midst of frigid sub-freezing temperatures. According Appalachian Power spokeswoman Jeri Matheney, reported in the Gazette, "electricity has not yet been restored because repair crews are having trouble accessing the extent of the damage. About 2,400 people were evacuated or displaced by the train derailment, according to the Federal Emergency Management Agency." Investigators the Pipeline Hazardous Materials Safety Administration are also already at the scene, and more staff are on the way. Because of the unknown quantities of spill from the exploded or burnt cars, or tank cars in the river, Officials in Montgomery, downriver from the accident, were told to shut down their water intake as a precaution. Reduced water intakes from the Kanawha river have forces water conservation restrictions. One person was treated for smoke inhalation, officials said, but, miraculously, no other injuries have been reported. Kelley Gillenwater, a spokeswoman for the state Department of Environmental Protection, said that the fires were keeping DEP officials from being able to fully examine the site of the derailment to determine what sort of containment and cleanup is going to be needed. Full details of water sampling being done by the state were not immediately available, but Gillenwater said that so far the results had come back "non-detect." Gov. Earl Ray Tomblin declared a state of emergency in Fayette and Kanawha counties after the derailment. Tomblin scheduled a news conference with federal and state officials at 2 p.m. Tuesday at the Montgomery Fire Department. In April 2014, a train carrying crude oil on the same North Dakota-Virginia route derailed in Lynchburg, Virginia. In July 2013, a 74-car train carrying Bakken Shale crude oil derailed in Quebec, Canada, setting off fires and explosions that killed 47 people. On Saturday, at least seven rail cars carrying crude oil caught fire in Northern Ontario after a train traveling from Alberta to eastern Canada derailed, according to media reports. What's riding through your town ready to send you to hell? This article was originally published in People's World by John Case.